This week my post will be about the deployment about the deployment of Windows 8 and then including optional Windows features. I already did a post like this about Windows Server 2012, and the methods are similar, but I’m still getting, and seeing, lots of questions about how it works for Windows 8. So what I really want to show in this post are the different options for deploying Windows 8 including some random Optional Windows Feature(s). The three most used options for this are DISM, Powershell and MDT. Well, actually, to be really correct, there is only one option to install Features in Windows 8 and that’s DISM. Both, Powershell and MDT are just different methods for calling DISM actions. In the rest of this post I will show these three methods and in all three examples I will install the same the same feature, TelnetClient. Why this feature? Well, actually just because it installs quick. Install KB2801987 on all site servers. Offline service KB2756872 into the Windows 8 image. Create a Install an existing image package –Task Sequence, with the mentioned packages of the previous steps (no need for the steps State Migration, Include Updates and Install Updates). 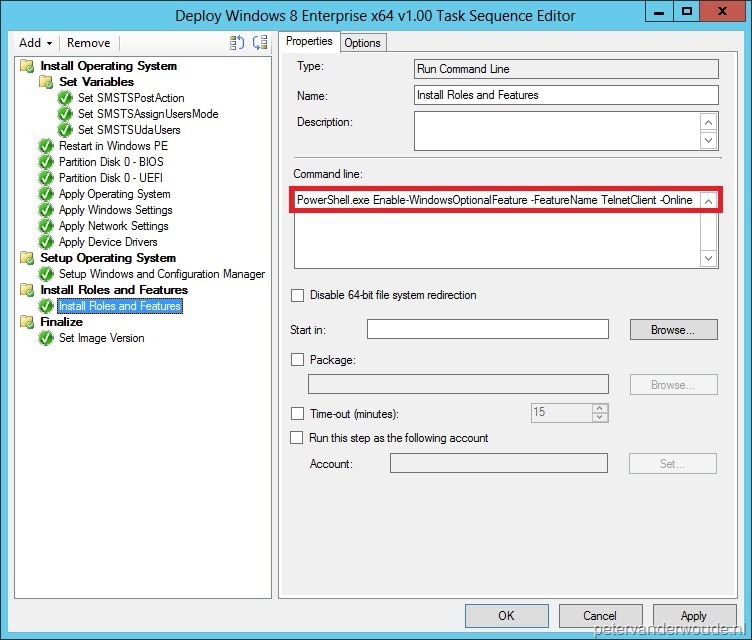 Edit the new Task Sequence and add a Run Command Line –step (see picture). Now add the command line Dism.exe /Online /Enable-Feature /FeatureName:TelnetClient. Note: To find the name of the features that we want to install, use: Dism.exe /Online /Get-Features. Also good to know, in Dism it is necessary to specify the top-level feature before we can install a sub-level feature. 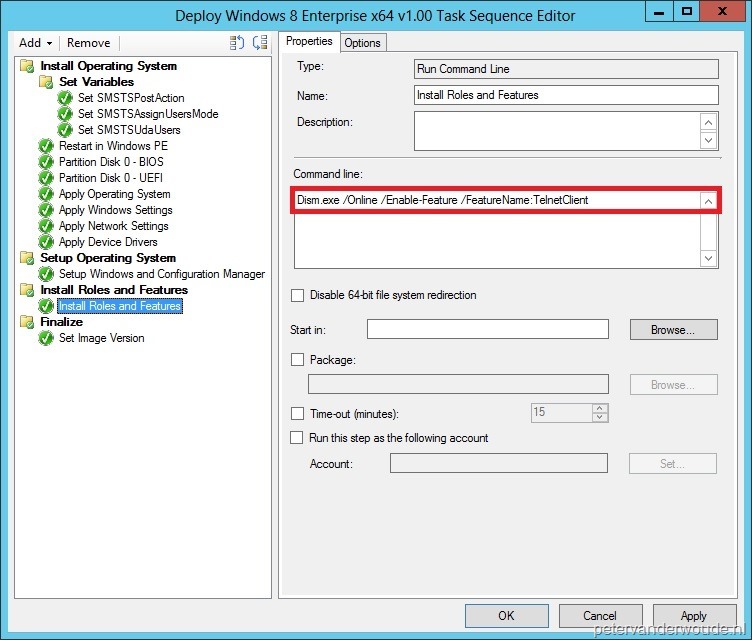 Edit the new Task Sequence and add a Run Command Line –step (see picture). Now add the command line Powershell.exe Install-WindowsOptionalFeature –Name TelnetClient –Online. Note: To find the name of the features that we want to install, use: Powershell.exe Get-WindowsOptionalFeature –Online. Also good to know, in Powershell it is not necessary to specify the top-level feature before we can install a sub-level feature. Edit the new Task Sequence, add a Use Toolkit Package –step, add a Gather –step and add a Install Roles and Features –step. Here we can select the Operating System and the Features (see picture). Note: To deploy .NET Framework 3.5 there are extra sources needed. Create a network share with the contents of the sources\sxs –folder from the Windows 8 –media and add a Set Task Sequence Variable –step. 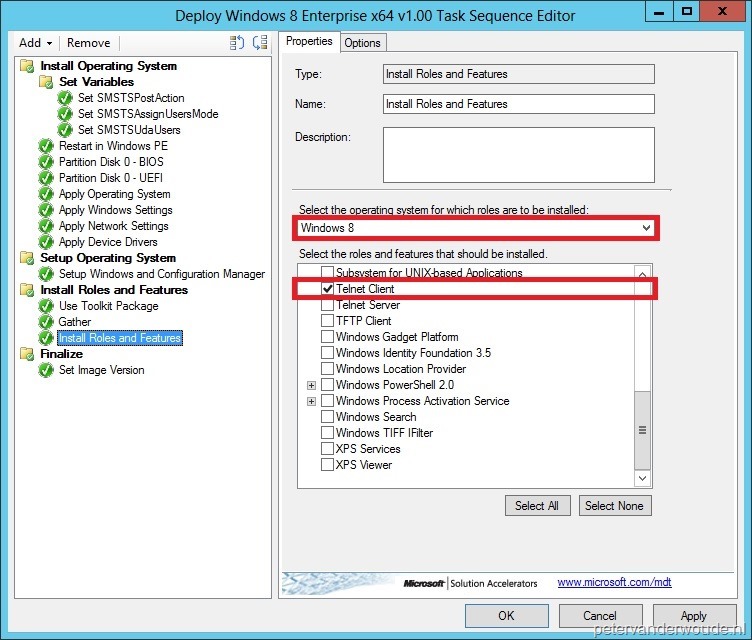 Set as Task Sequence Variable WindowsSource and as Value <NetworkShareWithSXSFolder>.